Mini Reviewer, Izzie (6) is still finding her feet when it comes to reading independently. This book has been ideal for her, with its relatively large, clear font, short chapters and line art illustrations, it is specifically designed to aid comprehension and keep young readers engaged throughout. This adventure takes the trio to Ancient Egypt where they have to find the Pharaoh's special cat, Cleo. There was a tower of boxes and on the top of the tower a magical kitten appeared. She spun around Olivia and Grace's feet and then they went to Ancient Egypt. They met a girl called Beset and had an adventure. They had to find the Pharaoh's lost cat. Then they returned home and the magical kitten disappeared and they wondered if they would see her again. I liked this story because I quite like cats. It was a magical story and I learned some things about Ancient Egypt. I found out about Hieroglyphs and I liked seeing how Beset, the Egyptian girl, was dressed in the pictures. 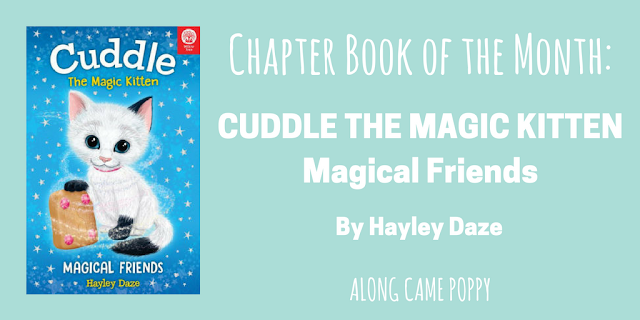 I would now like to read the next Cuddle story (Cuddle The Magic Kitten - Superstar Dreams). 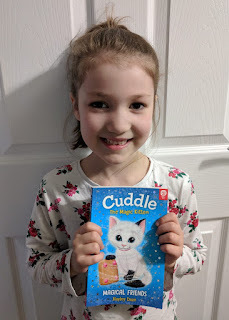 So it looks like we will be going on another adventure with Cuddle very soon! Both Cuddle stories are available now. Disclaimer: We were sent a copy of this book for review consideration. Our opinions are as always our own.